To most of us those questions are not of huge importance, we just dance because we enjoy it. But some people have worked harder than we have to find out more about "the morris", so here are some of their ideas. It is thought that the dance came to England much earlier, and was being performed in the 1400s. It was documented as morris dance in records of the Worshipful Company of the Drapers of London in 1477, when dancers were paid a large sum to perform on St Peter's Night (June 29). For some time it remained an entertainment to be watched by royalty and nobility, and displays were confined to London. Gradually it spread to major civic functions such as Lord Mayor's parades and guild processions. In 1540 it was still regarded as hideously expensive, and not seen as an activity for the common people to join in. During Queen Elizabeth's reign morris dancing gradually spread throughout the south of the country and began to be performed at other events where dancing already took place - at church Ales, Whitsuntide celebrations and May Days. It was practised for recreation, at weekends and for general common festivities. 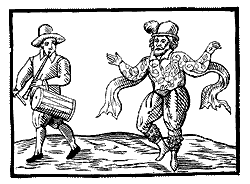 Shakespeare made several references to morris dancing, associating the dances with May Day and Whitsuntide. Will Kemp (a one-time colleague and member of Shakespeare's theatre company) performed what would now be called a publicity stunt by dancing from London to Norwich. He took 9 days to do so - not consecutive days but it was still a considerable feat- and he published an account of his journey in 1600. His "Nine Daies Wonder" is a phrase still in use today - how many people know that it originally referred to morris dancing? The increasing popularity of morris did not have the approval of some of the stricter Protestant members of the community, who would have liked to have seen it abolished. They classed morris dancing along with maypoles as heathenish and ungodly - after all, May Day was associated with an ancient pre-Christian celebration. This is possibly the origin of the belief that morris dancing itself was pagan. Throughout the 1600s disapproval strengthened and such fun-loving activities were prohibited under the Cromwellian Commonwealth. Proof that you can't keep a good thing down came with the Restoration - maypoles and morris dancing flourished. Estate account books contain references to the payment of local dancers by the gentry for performances at village events, and by 1700 the dance was regarded as entertainment for all. This mention of costumes is interesting, and can be compared to some images of dancers in a famous window called the Betley Window. The common people in many parts of England still practise what they call a "Morisco" dance, in a wild manner, and as it were in armour, at proper intervals striking upon each others Staves, and winding their Horns. It is unfortunate that precise descriptions of dances don't seem to exist. We don't have contemporary collections of music for morris dance, and there are no references to different styles in different parts of the country. We can't even be sure that all the forms of dance described as morris derived from the same source. But all the material we do have indicates that by the mid-1700s "morris" implied dancing as a display, in the open air, with bells, ribbons, sticks and noise - just as it does today. In the 1900s, folk dance became a subject for study - probably because the dances were becoming less popular and acquiring a rarity value. The most well-known name is probably that of Cecil Sharp, who travelled round England, documenting his findings of folk music and dance. He is strongly associated with what has become known as Cotswold morris but he also recorded traditional dances from the north-east of England. Other regions of the country were not so rigorously observed. After the First World War many morris teams disappeared, along with other old customs - many of the men dancers simply never came home. Few sides survived the Second World War but the dances reappeared later in the 20th century as new generations started to research and revive the old traditions. Written records were used but couldn't provide all the information required, so memories were taxed and imaginations used when all else failed. At last dance styles other than Cotswold were collected, and many of the dances of the north-west and the Welsh/English borders were given notations. The result was (and is) a wide range of "traditions". And yes, women do dance. Some people believe that "the morris" is, strictly speaking, the Cotswold tradition , that it should only be danced by men, and that all the other forms of dance should be known as "traditional dance". There are, however, lots of sides that consider themselves to be morris dancers, whether men or women. 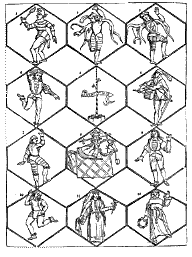 Some argue that morris has always been danced by women - Shakespeare/Fletcher have a group of 6 men and 6 women dancing morris in "The Two Noble Kinsmen" - even if this was set in Athens! It's also true that in many cases it was the women of the villages who remembered the old traditions and kept the sides going, the men having been killed in the wars. If the women hadn't danced, and taught others, the tradition would have died out. Cotswold, Border and North-west are probably the most common styles, but there's also Molly, Rapper and Sword dancing. Carnival morris, sometimes called "fluffy morris" is popular in many towns in the north-west of England, but carnival has developed a competitive ethos which separates it from the other morris traditions. (You can also see other examples of traditional dance around the country - such as the Abbots Bromley Horn Dance, the Padstow Obby Oss and the Helston Furry Dance - but these are never referred to as morris.) Many morris sides celebrate other customs, such as Mumming or Soulcaking, building the traditional Rushcarts, or performing alongside oddly dressed "Fools". The styles are not confined to their original areas any longer - it's possible to see examples of all the styles all over the country these days, indeed all round the world. Some groups strive to accurately recreate what they believe was done in the past while others believe that dance is a living tradition that changes with time, and enjoy the dance for what it is today. Anyone wishing to dance or play for a morris side will find one to suit them, somewhere!